Starry Night is considered van Gogh´s greatest artistic achievement and it is one of the most famous and reproduced images in the art world. Starry Night is still in great demand from consumers and is recognized all around the world. Van Gogh created Starry Night in 1889 just thirteen months before his death. At this time he was staying in an asylum at Saint-Remy in France and his behavior was particularly erratic due to his severe attacks. Starry Night is believed to show the view from his bedroom window at the asylum. 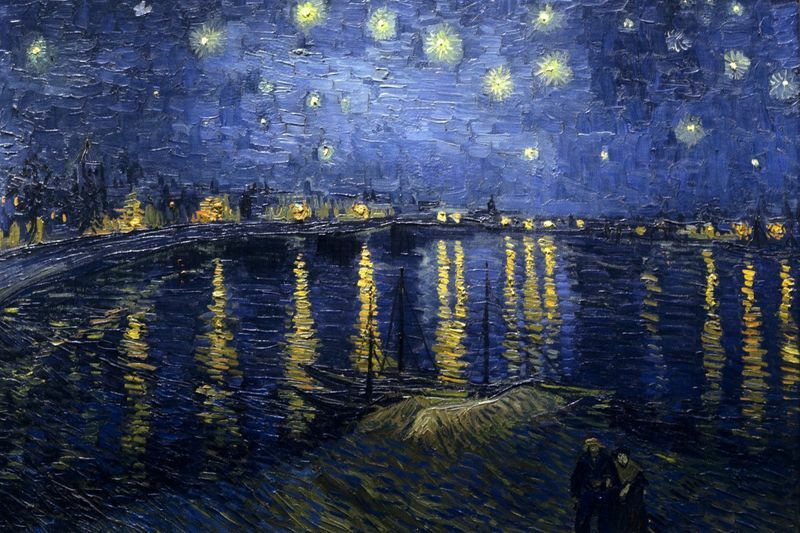 The Starry Night painting was not van Gogh's first nocturnal canvas, as he had already completed Starry Night over the Rhone and Café Terrace at Night the previous year. Van Gogh had the desire to paint a canvas from imagination, believing this would add more value to the piece, and said: 'we may succeed in creating a more exciting and comforting nature than we can discern with a single glimpse of reality'. In a letter to his brother, Theo, the artist stated that he wanted the theme to be: 'a starry night with cypresses or possibly above a field of ripe wheat'. Starry Night was the fulfillment of van Goghs wish to paint from memory and this could explain the greater emotional impact of this work in comparison to others he produced at this time. "In all this batch I think nothing at all good save the field of wheat, the mountain, the orchard, the olives with the blue hills and the portrait and the entrance to the Quarry, and the rest says nothing to me, because it lacks individual intention and feeling in the lines. Where these lines are close and deliberate it begins to be a picture, even if it is exaggerated. That is a little what Bernard and Gauguin feel, they do not ask the correct shape of a tree at all, but they insist absolutely that one can say if the shape is round or square - and my word, they are right, exasperated as they are by certain people's photographic and empty perfection. Certainly they will not ask the correct tone of the mountains, but they will say: In the Name of God, the mountains were blue, were they? Then chuck on some blue and don't go telling me that it was a blue rather like this or that, it was blue, wasn't it? Good - make them blue and it's enough!" Van Gogh's night sky is brimming with energy and it contrasts with the silent village below. The town he depicts in Starry Night is somewhat invented and the church spire brings to mind his homeland, the Netherlands. Van Gogh includes a cypress tree in the left foreground which is usually found in cemeteries and associated with mourning. This tree serves to connect earth and sky and this could reflect the artists own thoughts about death - that death is the destination of lifes journey. Thus, Starry Night appears to represent van Gogh's ongoing concern with death and the afterlife and he says: "Looking at the stars always makes me dream. Why, I ask myself, shouldn't the shining dots of the sky be as accessible as the black dots on the map of France? Just as we take the train to get to Tarascon or Rouen, we take death to reach a star." With Starry Night van Gogh moves away from the traditional Impressionist connection with nature and instead adopts a feeling of impatience. His swirling brush strokes give the impression that this painting is constantly moving and his palette is much more vibrant than in earlier works. Its thought that van Gogh was the first artist to paint these nocturnal scenes directly, and in order to do this its thought that he used to hang candles around his hat so that he could see. It's also believed that van Gogh stayed up three nights to finish the Starry Night painting and his philosophy was that night was "more alive than the day." The fact that van Gogh was living in an asylum when he created Starry Night has led to questions about his frame of mind and this has left Starry Night wide open to interpretation in terms of meaning and significance. One account refers to Van Gogh's desire to help the poor and his earlier dedication to religion. It proposes that the eleven visible stars are related to a quote from the book of Genesis and that the church spire is linked to the passage. 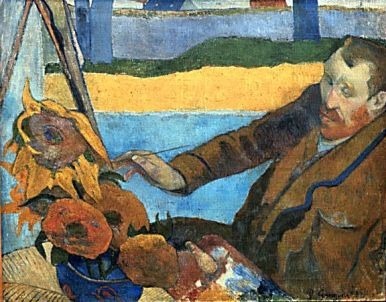 For van Gogh, however, this painting was a means of proving his worth as an artist and it was an opportunity to rival the work of artists such as Gauguin and Bernard. With its unique style Starry Night is a much-loved painting that has been the focus of poetry, fiction, and music, including the famous song "Vincent" or "Starry, Starry Night" by Don McLean. The canvas can today be found in the Museum of Modern Art (MoMA) in New York City.